Natchitoches meat pie; photo by Carolyn Riccardelli on Flickr (noncommercial use permitted with attribution / no derivative works). The city of Natchitoches in northern Louisiana (named after the Natchitoches Indian tribe, pronounced NAK-uh-tush) offers a regional delicacy popular since the late 1700's - the Natchitoches meat pie. Activities at the annual Natchitoches Meat Pie Festival include a meat pie cooking contest and meat pie eating contest. 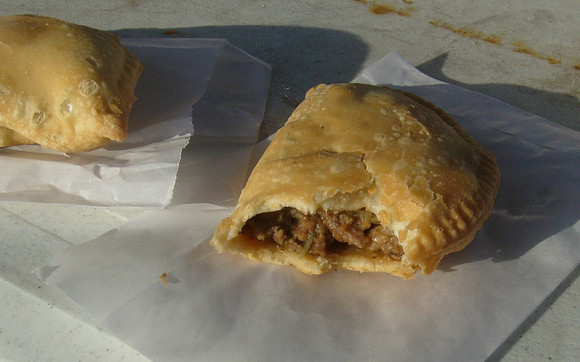 A mini Natchitoches meat pie is the appetizer of the official state meal of North Louisiana.